LOS ANGELES (Bloomberg) -- Electric-car maker Tesla Motors Inc. may have slipped back into the red last quarter, reversing its first-ever profit in the prior period, after revenue declined sequentially on a lease-style financing program. The company may report a loss of 20 cents a share excluding some items, the average of 10 analysts surveyed by Bloomberg. Palo Alto, Calif.-based Tesla is projected to report $387.9 million in revenue, the average of 10 estimates, after generating $561.8 million in sales in the first quarter. Tesla has said the sales of some regulatory credits to other automakers, which helped its first-quarter profit, would decline. Leasing and expansion into Europe also damped second-quarter results. The company’s shares soared after it posted first-quarter net income of $11.2 million, which was also aided by a one-time benefit from accelerating a U.S. loan repayment. “These kinds of issues are more signs of Tesla becoming a real car company, not an experiment,” said Karl Brauer, an analyst for Kelley Blue Book, an industry pricing and data provider in Irvine, Calif.
Tesla began in April a lease-style finance offer that may have limited Model S revenue recorded for the quarter, said Elaine Kwei, an analyst for Jefferies Group, who who rates the shares a buy. Initial shipments to Europe, for final assembly in the Netherlands, won’t be recorded as revenue until the year’s second half, she said. Tesla's stock -- one of the big stories on Wall Street this year -- has surged more than fourfold, fueled by the first-quarter profit, a rave Model S review by Consumer Reports magazine and a rushed repayment of the Energy Department loan that got the company’s factory into operation. Tesla had $85 million of revenue from both California zero- emission vehicle credits and U.S. corporate average fuel economy-related credits for the three months that ended March 31, according to a May regulatory filing. 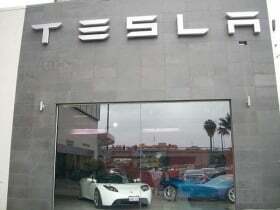 Tesla’s California credit sales will drop in each successive quarter this year, Musk said in May. Perhaps most significant will be how many units of Model S the company forecasts to deliver this year, said Ben Kallo, a San Francisco-based analyst with Robert W. Baird & Co. who rates Tesla shares outperform. “More than the bottom line, I think people are going to be focused on deliveries and margin improvement,” Kallo said. He estimates the company may deliver as many as 22,000 cars this year. Kwei expects at least 21,500 deliveries of the Model S, priced from $69,900 before a $7,500 U.S. tax credit. Tesla fell 1.7 percent to $142.15 at the close in New York on Tuesday. The shares have risen 320 percent this year through Aug. 6, the biggest gain among global automakers. CEO Elon Musk, who is also Tesla’s biggest shareholder, declined to discuss any change in the annual sales target in a July 10 interview at the carmaker’s plant in Fremont, Calif.
Production of Model S began in June 2012, and the company struggled to reach a production pace of 400 cars a week and missed an initial 5,000-car sales goal last year. A development this year that wasn’t foreseen for Tesla was the degree to which Model S would become a particularly trendy car in California and other markets, said Brauer.